The patent process timeline may be drawn out and expenses incurred over and above the cost of preparing and filing the patent application. The discussion below is directed to the typical life cycle of a normal patent application. 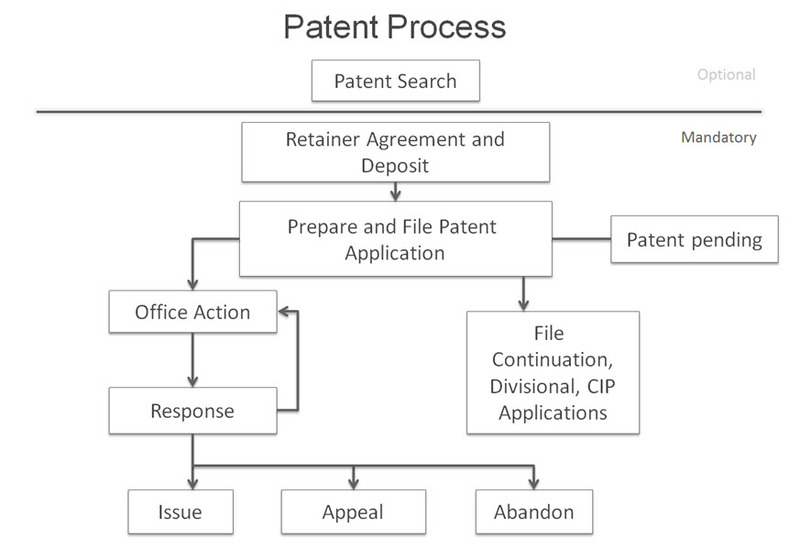 The overall patent process timeline begins with a patent search. It is an optional step and you need not conduct a formal patent search. However, there are advantages in conducting an informal Do-it-Yourself patent search. (Click here for DIY patent search instructions from the USPTO). The reason is that the cost of conducting a formal patent search through a patent search firm may outweigh its benefits as discussed below. After the patent search, the next step is to file a patent application with the United States Patent and Trademark Office. Upon filing the patent application, your product is now patent pending. Some refer to this stage as being patent protected but the phrase “patent protected” is misleading. The product is patent pending but not patent protected in its fullest sense. The product is protected in that the filing date of the patent application prevents others from learning of your idea through your marketing efforts and filing their own patent application on your idea. The reason is that any third party filing will be junior to your first filed patent application. As such, your idea is patent protected in the sense of its pendency. By no means does patent pendency provide any sort of enforceable rights to stop others from marketing your idea in the marketplace. For that, you would have to wait till your patent application matures into a patent. If your first filed patent application was filed as a provisional patent application then a follow up non-provisional patent application must be filed within one year. If the patent application was filed as a non-provisional patent application, then it has entered the queue for examination. Examination is typically based on a first come, first served basis. Normally, utility patent application are examined within about 1-3 years depending on the then current backlog at the Patent Office and the art unit your patent application is assigned to by the Patent Office. The 1-3 year time period you have to wait for your patent application to be examined can be cut down to a time period of about 6 months by filing a prioritized examination request. This is a pure pay-to-play system. The prioritized examination moves your patent application from the back of the line to the front. If the issuance of the patent is important to potential investments, sales, enforcement strategy or other business purpose, then prioritized examination is a great tool to expedite examination, and hopefully, issuance of a patent. If one of the inventors is over 65, then the examination process can also be accelerated by filing a petition based on the inventor’s age. Otherwise, in my opinion, waiting and redirecting the fee you would have spent on prioritized examination to marketing or product development may be more useful. Here is where the formal patent search may be less useful. The formal patent search for all intents and purposes is merely the opinion of a patent attorney regarding the probability that the Patent Office will grant or deny the patent application for patent. However, the scope of prior art is worldwide, and includes patent applications that may not be published until after a patent application is filed. Thus, the search may miss references which are found and used by the Patent Office to reject the patent application. A formal patent search is never a guarantee of whether you will obtain a patent. By requesting prioritized examination, the opinion of the examiner at the Patent Office is obtained in about 6 months time. Preparing the patent application and filing the prioritized examination request is significantly more expensive than going through a formal patent search. However, if the grant of the patent is of high importance, then forgoing the patent search and filing a patent application with prioritized examination MAY be a better option. Nevertheless, there are apparent advantages of conducting at least an informal patent search. Once your patent application is examined, the Patent Office will mail an office action. The office action is simply the official stance of the patent office on whether they will grant or deny one or more claims in the patent application. This is the merely the initial opinion of the Patent Office. The patent attorney’s role is to convince the examiner that the claims are patentable by amending the claims and providing arguments to support patentability of your invention. Most patent applications at the Patent Office are initially rejected. Hence, the mere rejection of the claims of the patent application is not a good indicator of how prosecution will go for the patent application. Instead, it is better to take a substantive review of the cited prior art references and have a discussion as to whether the examiner cited relevant or art that would be easy to overcome. A patent attorney responds to the office action by preparing claim amendments and arguments in support of patentability.The office action and response cycle is should be completed at least once or twice to get a good feel for the examiner’s stance on the matter. If successful, then a patent is issued and you may at that point enforce your patent against your competitors. If unsuccessful, then an appeal can be made to the Patent Trial and Appeal Board (PTAB). If marketing of the product is not doing well, then you can always abandon the patent application without incurring any further costs. Throughout the entire pendency of the patent application, all persons involved in the patent application have a duty to disclose relevant information that might cause the examiner to reject the patent application through an information disclosure statement. Overall, the patent process timeline is a long drawn out process which can be shortened by petition. Moreover, the costs associated with the patent process does not end with the filing of the patent application. There are other downstream costs due to further communications between the patent attorney, the patent office and the client.